Author’s Note: I am not responsible for the Yellow Ribbon campaign and it’s not officially associated with DINOS™ or Notes From a Dog Walker. If you’d like to learn more, here’s the source of the project and the newer Yellow Dog project. Those hard-working folks deserve all the credit – not moi! To say that folks are excited about the color coded system is an understatment – social media is bubbling over with dog owners who have raided craft stores for yards of yellow ribbon. I’m expecting to start seeing dogs wrapped completely in yellow, waddling down the street like little sunshine colored mummies! I think color coded systems are a MUST HAVE for any closed group: dog walking clubs, sporting events, camps, etc. Any place where everyone is on the same page and fully understands what the colors signify. Many groups, like Chicago SocialBulls use a fun combo of bandanas and various flair, to help dog walkers communicate with each other. It’s very effective in a closed group. I totally recommend it. When it comes to using the color system in public, I say go for it, but with some concerns (see below). I have no doubt it will help some people communicate with some strangers while they’re walking down the street. I’m thinking in particular of dogs with medical conditions, like my pal Taz who has epilepsy and needs space from other dogs to avoid having cluster seizures. A color system that can help Taz get the space he needs? Super awesome. 1. This won’t do much, if anything, to help us communicate with dog owners that just don’t care. That includes people who ignore leash laws or let their dogs wander loose, people who let their dogs charge into our yards, people who think that our dogs will learn to like other dogs if they just meet their friendly dogs, people who ignore the “Do Not Pet” patches on Service Dog vests, the people who don’t listen to us say “No” now..and others. That’s a pretty big group. 2. This only works if people can see the yellow flag (and know what it means). So if they’re walking up from behind and can’t see the leash, it’s not going to help. Oh and some folks just won’t get it. My friend, who does not have a DINOS, saw this poster and commented that it looks like a poop bag is tied to the leash. 3. So, that means that the color system should be viewed as just one tool in a larger toolbox. If you’ve got a yellow tie on your dog’s leash, don’t assume the people around you can see it, know what it means, and/or care. So we still need to be proactive and on our toes. We can’t rely on a yellow flag to do the work for us. It might work sometimes, it might not. Ultimately, we are responsible for our dogs. 4. Which brings me to liability issues. I’m not sure if it’s the pit bull owner in me – the one that is extremely wary of publicly declaring my dog might be “dangerous” in some way – but the language in these Yellow Dog posters worries me. If I were behind the Yellow Dog campaigns (some people think it is me, but I can’t take any credit – this isn’t officially associated with DINOS in any way), I’d run my language and messaging by a lawyer. Before I put a yellow ribbon on my dog, I’d want to be 100% sure I’m not making myself liable or seen as negligent if my dog gets into an altercation. (side note: can we please take the pit bull off of this poster? They have a hard enough time as it is. They don’t need to be the face of this campaign). Control your dogs, on leash and off leash, at all times. Always ask permission before you or your dogs approach an unfamiliar dog. If the answer is no, allow others the space to pass. No matter what’s hanging off a dog’s leash, if we all controlled our dogs and took a second to politely ask if we can approach, rather than assuming it’s ok, we’d all be doing each other a world of good. I hope the yellow ribbon campaign is a big help to those of you that decide to try it out. Please let me know what your experiences are, if you do, ok? In the meantime, I’m going to keep working with my friends at Design Lab (the folks who brought you the DINOS logo) on a complimentary project: we’re creating a poster that reminds people to always ASK, before approaching an unfamiliar dog. Hopefully, between the color coding and a campaign that encourages responsibility and respect for others, all of us with DINOS will get a little relief! 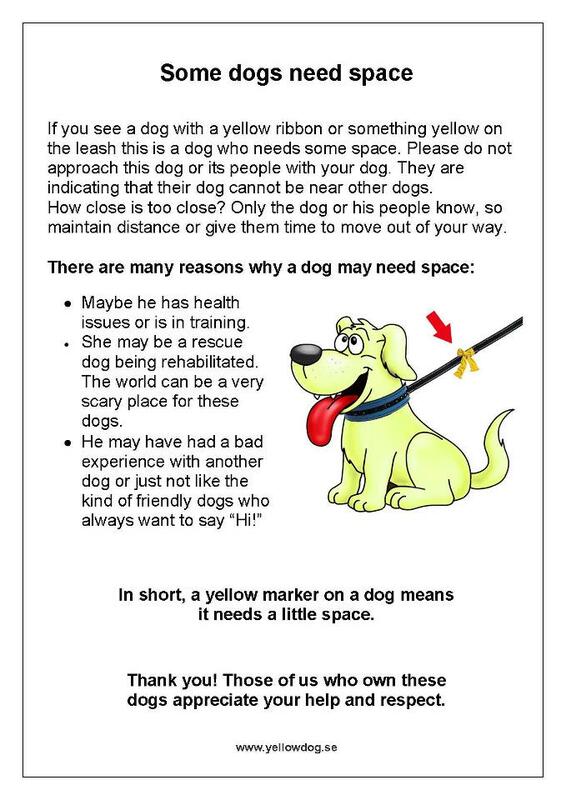 For more info on the yellow dog campaign, see the original source here! I thought the color-coded ribbon system thingy was a neat idea too, but yellow ribbons mean other things. Most people will just think that it is a decoration on the leash. We have a dog that is shy and fearful of some men, and we also have a DINO. For our shy dog, we found a yellow flag that slips on the leash that says “I’m Shy”. People are more likely to notice the flag with words on it, then a piece of yellow ribbon or fabric. Human nature though will step in with those people who simply ignore it and reach right out to our dog. As for the DINO, we have always used a backpack with “IN TRAINING” patches on both sides, so that people are more likely to move away from her with their dog. She is a DINO with dogs and NOT people. Despite the issues that my dogs have, they are both certified therapy dogs! So, all the hard work we have put in to the dogs, has paid off. No matter what we try to do to help our dogs get through life, human nature will usually trump the hard work we do. Flags can be found at http://www.dog-flags.com. Customized leash banners and bandanas can be found at http://www.identascarf.com. Great products to help us all. I don’t see how a yellow ribbon will do any good. 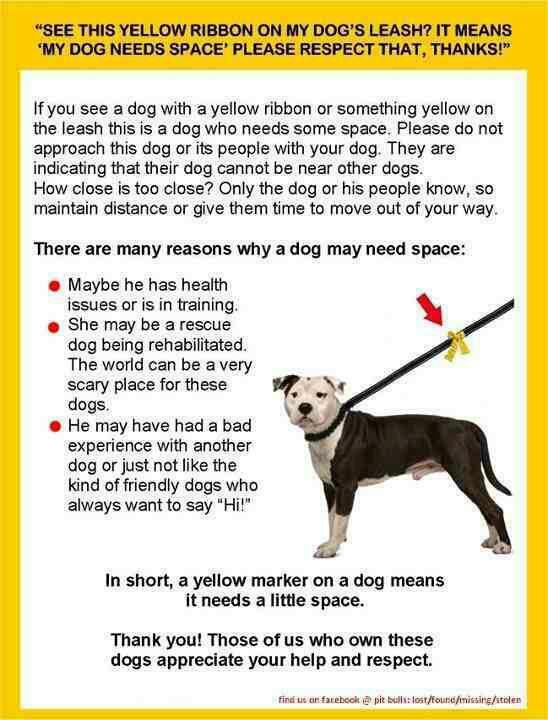 People who are rude blockheads to begin with and allow their dogs to approach any dog, a yellow ribbon won’t do anything. A practice I religiously follow is that when I see a dog approaching up ahead, I will plan to pull off to the side like onto a sidewalk, driveway or vegetation space, as I keep my dog’s attention with treats and practice focus. Even with this blatant move to avoid the approaching dog, so many people are completely oblivious and still allow their dog to pull them over to me and my dog and allow them to visit. I will still tell people, as they are approaching, “Please, do not allow your dog to approach,” and so many people STILL allow their dogs to approach and then give me a nasty, dirty look saying, “Hey, my dog is friendly. If your dog is not friendly, don’t bring them out.” Even after all this, I still have people verbally give me a bad time. About two weeks ago, I was walking my dog in an urban location, and I approached an intersection, waiting for the light to change. At the intersection, directly in front of me, waiting to cross in the opposite direction, in front of me, was a small yellow car with two small dogs aggressively barking and displaying toward my dog sitting with me, waiting for the light. The woman rolled down her passenger side and said, “Don’t worry. They are friendly.” As she was saying this, one of the dogs jumped out of her driver door window, ran in front of her car in the street, and ran straight toward me and my dog, displaying all teeth and intention. When the dog got within a couple of feet, I wacked the dog across the head with my plastic water bottle in my spare hand, and the dog immediately backed off. The woman was furious at me for hitting her dog with the water bottle! She was spitting every swear word in the book as she ran back to her car, and the cars were honking at her as she blocked the intersection. Things like this happen regularly as people who openly refuse to obey leash laws and common decency. I prefer to take things into my own hands and deal with each person one at a time. No person I have run across in the last three decades of walking dogs would ever defer to a yellow ribbon on my leash. One reason why I love your blog? You look at both sides and present great points for both. You are realistic about dogs’ individuality in that some might love canine company, and some might not. When I adopted my pit bull type dog, I learned a lot about doggie social skills. I learned that being dog-social is not a breed thing, but rather a dog thing. My big lug happens to be dog selective and reactive on-leash, and your blog, along with many others, has helped me come to terms with the fact that that’s ok. My dog is not broken and he’s not a bad dog. He’s just a dog, and presents his own challenges (of which he has many) and strengths (of which he has infinite). Thank you for your honest, no-nonsense words! Aw, thanks Lauren. Sometimes I feel like a nut: I can almost always see both sides of every argument. It’s very noisy in my head ; ) And I’m super, super happy to hear that you’re feeling ok about your blockhead’s selectiveness. Life is too short to wish we had a different dog. It’s more fun to just celebrate them as they are (and hit a few training classes, of course)! i agree…take the pitty off the poster and put a different dog on there….I hadn’t heard about the yellow ribbon and am not sure i would use it, because I own a pitty and with all the assumptions just makes me worry more and that’s the last thing i need. but i like the concept. The original poster had a cartoon dog on it, actually. http://rumpydog.files.wordpress.com/2012/08/need-my-space.jpg link to the picture. I do wish they’d take the Pittie off though. And I do hope it doesn’t come with liabilities.. I also thought it looked like a poop bag…..im overwhelmed by our eagerness to color code everything in our society lately, Pink is for breast cancer awareness, Red is for heart disease, blue is….i cant remember, Autisim? Anyway I think that the dog charging up to you off leash will not notice what color ribbon is tied to your dogs leash. And most likely the owner is not paying attention to begin with. I looks like an old thread but I’ll add to it with my thoughts. But, you need to go out there and do it as in making folk MORE aware no matter what group you are in hopefully working together. Not to say your’s isn’t good, it just doesn’t seem to work for me with flags and such. The most success I’ve had with a signal object has been a walking stick. I’m older, 59 and have some health problems so after a few falls, I started carrying a 5’5″ hickory walking stick when I walk my two reactive jack russells. There are stray dogs in my area, there are loud thoughtless people, thoughtless clueless people with dogs and varying combos of these. At first my little ones were scared of the stick, but training handled that soon enought. Stray dogs are scared of the stick and it makes a mean club when they run up to investigate. People are interested in the stick, don’t come straight up to the two little barky dogs, and people with dogs don’t let their dogs run up for fear of them getting hit. Some people just want a stick like mine. I actually had a person with an off leash dog whose dog jumped on an older dog in the park in front of me. I took my long stick and poked his younger dog in the ribs and he ran back to poppa saving a stupid thing from turning into a bad thing. No vet bills. Now, you can’t be afraid to use the stick if you need it. But mostly, people are more interested in learning about it than arguing or fighting. The five footer is a good length and Hickory is the toughest American grown wood. The Brazos Stick company out of Waco TX has all kinds available for a good price and shipping. I agree with you on all counts. It will only work if EVERYONE knows what it means and I too have a problem indicating that my dog might even be the tiniest bit aggressive. You have made a lot of great points here. My first thought when I heard about the campaign was that I doubted most members of the public would even pay enough attention to question the yellow ribbon, let alone do the research to know what it means. It’s a great idea in theory but so hard to put into practice. I think the idea behind colour coding is decent… but that the issues with it outweigh the uses. Chances are the only people who will recognise that coloured ribbon for what it is are the people who already treat unknown people and their unknown dogs with respect. I much prefer the “ASK policy”. Before I approach any dog, or let my dog do so, I ASK if their dog’s friendly, and then if it’s ok to approach and say hello. I’ve met people who ask that I not pet their dog, but that the dog is friendly with other dogs – just nervous of strange people. And lots of people who dont’ want our dogs to meet, or are more than happy to let their pooch engage in a bum-sniffing session before carrying on. Since I starte the site and the campaign (Thr Yellow Dog Project) in Facebook, I’ll weigh in a bit. I’ll address the poster first. Lili Chin, the lady who designed Grisha Stewart’s illustrations for the BAT book and the original Mdif poster had agreed to provide a poster and subsequent art for the project. We want to steer from breed prejudices and into “all dog” territory. I agree that most people will ignore and continue to ignore warnings and “no” and anything else we do. In my community, I host a BAT class and I encourage people in other communities, cities, and countries to find, attend, or just read some materials. The Yellow Dog Project website will be linking to many trainers (as you have done) and resources. As for bull headed people who don’t get Thr message now, the world is not perfect and I hope that by them continuing to run into people who promote these ideas, they get it that they are in the wrong. I’m also going to my city council to talk about bylaw enforcement and he lack of patrols. If people think “oh, my dog is ok off leash” and are rewarded by not getting reprimanded, they will continue. At my daycare, in my training, while dog walking and in my daily life, I promote an encourage leash usage for all my clients. I’d like to see lots of things happen to promote these ideas, but I’m one person in my town. I encourage people in their towns, be active, become knowledgeable, inform the public, and to promote healthy dog relationships. I teach pry safety in my town, have teamed up with bet clinics to offer the ribbons. The project is in its infancy and Im pushing for people to join the group. It might help to spread the word even more if everyone that is currently running a yellow ribbon campaign is working together. Please keep us posted on your efforts! I have contacted them, but have not heard back. I’m not sure what else to do other than email them again. Hi there Tara, they said they had contacted you and apparently you didn’t want the advertising. Is this right? Hi there, when you sent me a url to reply to on my post before I posted this one the url did not work! I am so excited that the awareness of “shy”, “deaf”, and “anxious” dogs have come to the forefront. Several clients have come to us to customize a Doodie Pack (a canine back pack) for their pup and have been met with resounding success when out and about. Not only is the Doodie Pack functional (carrying essentials on a walk like water, treats, first-aid kit), but it can convey the exact message you need to send since Doodie Packs can be customized. They come in a variety of colors, including yellow, and fit dogs 8-180 pounds. Made in the USA, I am so proud this company (of mine) continues to do such great work. We’d love to help you! No more ribbons that might confuse others.